Home » Disney World Dining » Disney Dining at the Crystal Palace! The Crystal Palace is an incredible Character Dining Venue! 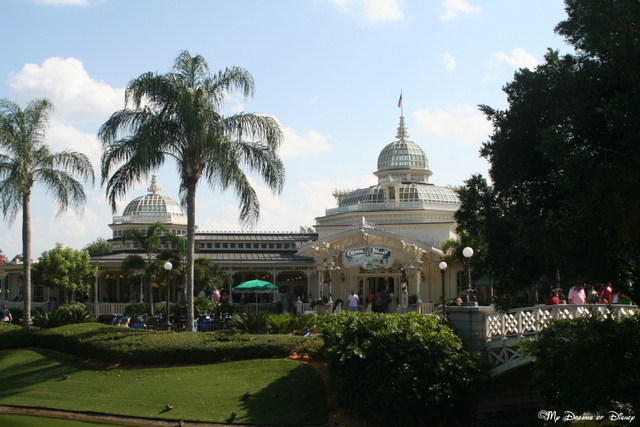 The Crystal Palace is a character dining venue located in Walt Disney World at the Magic Kingdom theme park. Located right by the Hub in the center of the park, Crystal Palace is a table service restaurant, like all of the character dining locations are, and this venue features Winnie the Pooh, Tigger, Piglet, and Eeyore from the Hundred Acre Wood. The food at the Crystal Palace is a buffet restaurant, and is open for breakfast, lunch, and dinner. During breakfast, you’ll find fresh fruit, cereals, breakfast potatoes and other comfort foods, fresh pastries, and an omelet station. During lunch and dinner you’ll find a carving station, salads, pastas, chicken, fish, and vegetable recipes, and house-made desserts for you to enjoy. What makes this restaurant stand out, in my mind, is location and the Victorian charm of the building itself. This structure looks like it was pulled up out of the Grand Floridian Resort & Spa and placed right next to Cinderella Castle. In addition to the location and venue, the characters do a great job of being available for the kids (and kids at heart!) 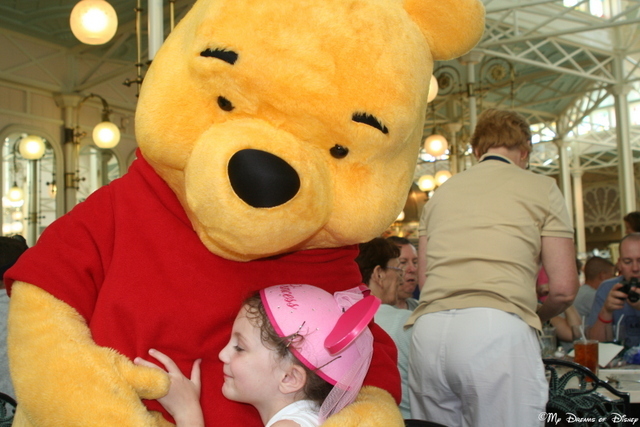 When our daughter Sophie was younger, my wife and I would take her about once a year to the Crystal Palace, and I have some wonderful memories of her hugging Winnie the Pooh and all his friends during our visits. Additionally, they also have a kids marching parade that Sophie enjoyed, and many other kids do too, it’s a great way for them to march off some of the energy they’ve stored up eating sweets from the buffet! Sophie loved meeting Winnie the Pooh! The Crystal Palace, like many of the Walt Disney World restaurants, is a very popular dining location, and as such, I highly recommend that you get your reservations when you can. For Walt Disney World, dining reservations can be made up to 180 days out, so take advantage of that! Like many things, planning a Walt Disney World vacation can seem to be a bit overwhelming — but if you do your homework, research the restaurants you want to experience, and talk with your family and your travel agent (if you have one), you will be able to get almost — if not all — of the reservations that you want for your trip. Thank you for stopping by! Have you eaten at the Crystal Palace? If so, what are your impressions of it? Let me know in the comments, and thanks! Mike is an Authorized Disney Travel Professional with Pixie Vacations. You can reach him via email at Mike@PixieVacations.com, telephone at 919-606-6725, or you can check out his blog at My Dreams of Disney. Mike is also on Twitter and Facebook. 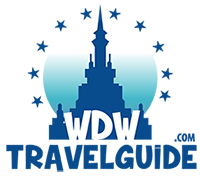 I am an Authorized Disney Travel Planner with Pixie Vacations! I am ready, willing, and able to help you plan your next Disney vacation, so please feel free to contact me at Mike@PixieVacations.com, or via telephone at 919-606-6725.